As the "Occupy Gezi" protests in Istanbul entered their fifth day Saturday, police withdrew from Taksim Square in an effort to calm tensions that so far have left at least a dozen injured. Law enforcement officers have used tear gas and high pressure water hoses on the protesters. The protests have spread to other areas of Istanbul and to the nation's capital, Ankara, where riot police also used tear gas on demonstrators, the BBC reported. Turkish Prime Minister Recep Tayyip Erdogan said Saturday that police may have used tear gas excessively in attempting to disperse demonstrators, but he was mostly defiant in his response to the violent clashes. "Wherever you go in the world, in places like this ... governments would take measures," he said, according to Reuters. On Saturday, Erdogan called for an immediate end to the protests, Reuters reported. 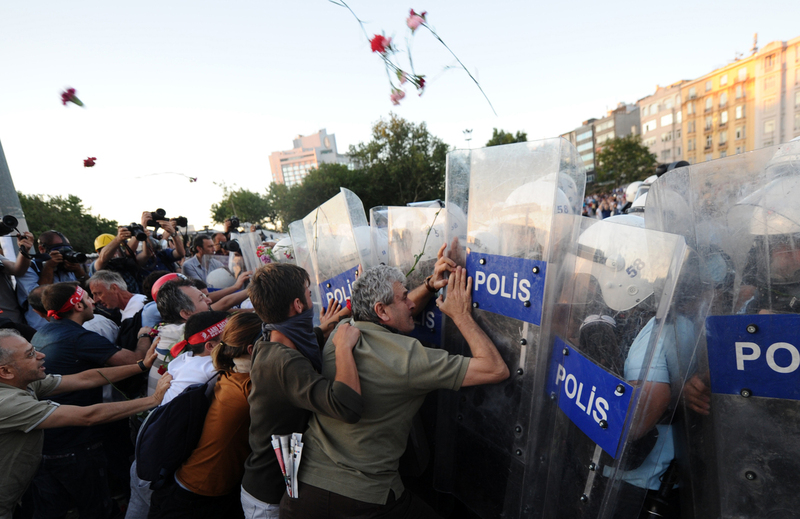 Some world leaders have criticized the violent tactics used by Turkish police. U.S. State Department spokeswoman Jen Psaki said Turkey's stability and prosperity were best guaranteed by "upholding the fundamental freedoms of expression, assembly and association, which is what it seems these individuals were doing." Martin Schulz, the head of the European Parliament, said in a statement that, "The severity shown by police is completely disproportionate and is leading to the spreading of the protests," according to Reuters. Reports that Turkish police have used plastic bullets on demonstrators have begun to circulate. Photos on Instagram appear to show welts and bruises from the projectiles. Earlier, police used jammers to block social media communication in Taksim Square, where the protests began, Sky News reported. The violence began early Friday morning when police raided a peaceful Occupy-type sit-in at Taksim Square, where demonstrators were protesting plans to demolish a small park to make way for new development, including a shopping mall.